A convincing endorsement of Yokogawa's leadership in the industry, Schering-Plough has once again opted for Yokogawa's latest DCS – CENTUM CS 3000 for their recent plant expansion at Tuas, Multi-Products Plant (MPP) Project in Singapore. This new plant, the largest manufacturing facility for Schering-Plough outside USA, is designed to double their capacity, and it includes R&D activities in chemical processing. Schering-Plough qualified Yokogawa because of its experience and expertise to fully execute and deliver Pharmaceutical Plant automation solution entirely by its local organization. Indeed, Yokogawa's commitment to quality and fulfillment with local expertise are the key drivers in ensuring the project success. This project has set new standards with which Yokogawa staff are very proud to be associated with. "Yokogawa is an excellent company to work with. They distinguished themselves through their strong commitment to customer service, meeting and quite often exceeding customers' expectations," commented Dr. Patrick Yeung, Executive Director Projects of Schering-Plough Singapore. Schering-Plough's Plant in Tuas, Singapore, utilizes state-of-the-art equipment for Active Pharmaceutical Ingredients (API) manufacture. The MPP project offered Yokogawa real prestige to be associated with the latest blockbuster drug production like Zetia for cholesterol management. The other key products manufactured using Yokogawa process automation solutions include 15 types of Steroids and four main categories of Synthesis - Anti-histamines, Anti-Asthma and Heart related. The demanding nature of pharmaceutical production business calls for strong corporate leadership, responsive R&D, dedicated employees, discipline in execution, high level of quality assurance process and comprehensive change management methodology. Yokogawa is able to provide unwavering support to assist customer in meeting Food and Drug Administration (FDA) regulatory requirements, particularly in areas of electronic documentation and electronic signature. An elegant solution, the technological advantage of CENTUM CS 3000 in providing extensive audit trails for operations as well as configuration management is critical for Schering-Plough to gain FDA approval for drug production in a highly integrated and automated plant. 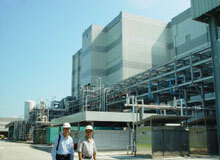 "Yokogawa's control system, CENTUM series, is a very good control system. With its installation, it certainly created an environment with much more control and reliability of processes, thus reducing the risk of errors and mistakes by our people and therefore have a greater assurance of quality of our products," said Dr Patrick Yeung. Yokogawa embraces Good Automated Manufacturing Practice (GAMP) methodology for pharmaceutical projects. Special training for the project quality and execution was mandatory for all engineers on the job. Beyond project delivery, Yokogawa is fully committed to full-life-cycle support of the system. For MPP Project, CENTUM CS 3000 is designed to handle multiple batch recipes, process control for numerous centrifuges, dryers and reactors. The system includes full integration of the control logics of centrifuges and dryers in the Field Control Stations (FCS). These major breakthroughs have passed stringent tests with support of specialized equipment from Europe. "We are very happy working with Yokogawa, to a point where we have continued to rely on Yokogawa to help us design and develop control systems for our new and very important expansion projects," concluded Dr. Patrick Yeung. Yokogawa's success with Schering-Plough MPP Project also involves an enlightened approach through Joint Management Agreement (JMA). The major drive for JMA was to improve efficiency of project execution and enhance quality of the system. It resulted in significant savings that improved the bottom line. The engineers are justifiably motivated to be associated with this world-class endeavor and the team has demonstrated diligence and pride in striving for better performance. The system has been shipped to site and is scheduled to start commercial production by Summer 2003.